With the recent onset of winter the late fall birding doldrums are over. There are few winter birds as such, but many of the permanent residents that breed away from the proximity of man are back in town. 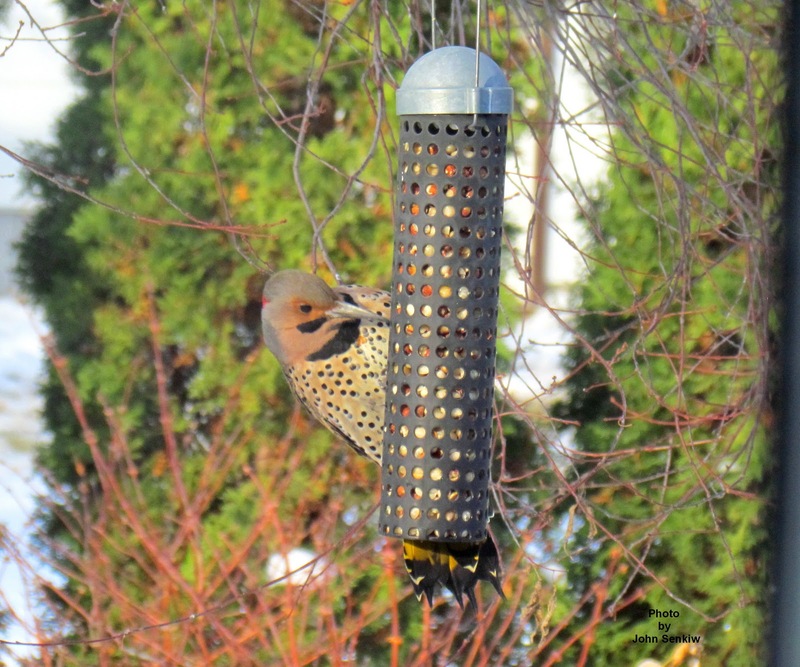 Since the snowfall our backyard has seen a lot of activity with the arrival of Hairy and Downy Woodpeckers, Ravens, Magpies, Chickadees, Blue Jays, the ubiquitous House Sparrow and a lone Northern Flicker. We are now waiting for some more of our usual visitors like the White and Red Breasted Nuthatches. Two winter birds, the Northern Shrikes and Pine Grosbeaks are already here. With a little luck we might even see several more irruptive species such as Bohemian Waxwings, Redpolls and Evening Grosbeaks. Of the birds listed above two are somewhat unexpected as they usually migrate a little bit to the south of us. The flicker is only one of two local woodpeckers that migrate at all and it goes just south of the Canadian border. 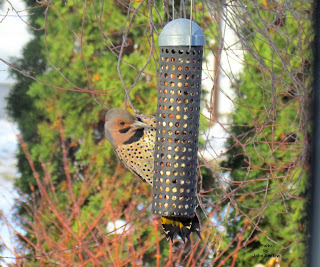 Of all the years that I have been watching birds I have never seen a flicker in the winter until two years ago at our daughter's place in Saskatoon. It was at her feeders at Christmas time with the temperature at -35C. 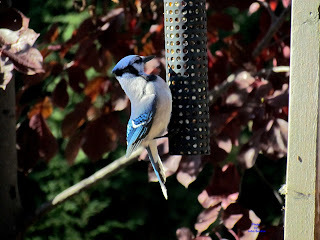 Another bird that I have seen only once before in the winter is the Blue Jay (see Article No. 98). According to the range maps in the bird books the Blue Jay migrates just out of the Boreal forest and should be a permanent resident here. However, the jay seems to behave much like the House Finch (see Article No. 7) and does go somewhere a little more pleasant with larger urban centres being the preferred choice. Even more to our surprise, four juvenile Cedar Waxwings spent one day in our yard last week. Although they do not migrate very far south, I have never seen a Cedar Waxwing this late in the year. Perhaps there are a few more surprises awaiting us. Coincidentally, as we were enjoying the Blue Jay in our yard this past week, we happened to watch a half hour TV sitcom whose theme centred around a jay that landed on the window ledge of the actors' apartment and refused to leave. Comedy aside, the jay was referred to as a Blue Jay when in fact it was a Mexican species, the Magpie Jay (see Article No. 42). I then recalled watching a TV show several decades ago about a duck that needed help. I do not remember much about it except the "duck", when finally shown, turned out to be a Canada Goose. If there is any point to all this it would be to be careful about what you hear and see on TV. This week's pictures are of a Blue Jay and Northern flicker eating peanuts at a peanut feeder in our backyard. Both birds also helped themselves to black oil seeds with the jay hauling off mouthfuls to store somewhere for future use. November has arrived and with it some late fall and winter birds. Just this past week we have seen Red Crossbills, Pine Siskins, a Northern Shrike and a Blue Jay. The jay has been hanging around the sunflower feeder for several days now providing me with some good photo opportunities which I took advantage of. I also got a shot of the shrike but was a bit disappointed in that it was a juvenile and not a sharply defined adult. The Red Crossbills "got away". As I was trying to decide on this week's topic and idly thinking about different birding events in the past, I happened to recall a statement made by a very interested but novice birder at one of my birding presentations. He maintained that some Purple Martins had come to his yard and proceeded to throw out young House Sparrows from their houses. I found this completely out of character for Purple Martins but had no explanation for it at the time. Sometime after that it dawned on me what had probably happened. 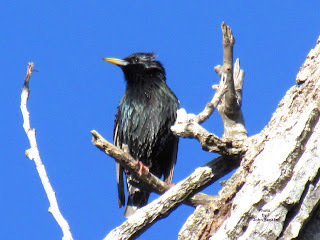 A close lookalike, the aggressive European Starling, was probably the culprit that did the ejecting of the young sparrows and not the Purple Martin. With careful observation the differences between the two are quite noticeable, but a casual glance at a starling, especially one in flight, often results in it being misidentified as a Purple Martin. The European Starling belongs to a family of birds that is confined to the old world and has no native counterparts in the Americas. Sixty starlings were introduced by the English in 1890-91 to Central Park in New York City and now number 200 million in the US alone. One of the major supporters and active participants of this effort was a literary society dedicated to Shakespeare that wanted to introduce every bird to North America that was mentioned in Shakespeare's literary works. It was successful with two: the starling and House Sparrow. Fortunately, other attempts failed. The starling is a dark, stubby tailed sparrow-sized bird with a longish needle-like bill. (The bill shape is the easiest way to distinguish the starling from the stubby-billed Purple Martin). During the breeding season the male moults from brown to a shiny black that in good light reflects blue and purple making the bird quite attractive. A rather rare characteristic is that the bill also changes colour. During the breeding season it is yellow and then black the rest of the year. The bill is unique in another way that is very interesting but of no value in identifying the bird in the field. The jaw muscles of most birds work to clamp the bill shut with a lot of force. Large parrots, for example, have reportedly snapped a broom handle in two. The jaw muscles of the starling work in reverse. Although they do work to clamp the bill shut most of the muscles' power is used to snap the bill open. This feature allows the starling to pry its closed bill into dense leaf litter or tangled grass then snap the bill open parting the leaves or grass and exposing insects, worms, spiders and so on. 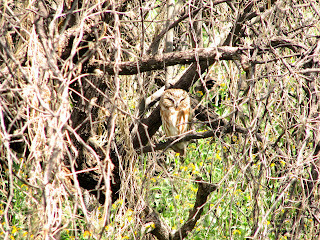 In addition, it has the unique ability to rotate its eyes forward giving it binocular vision with which to zero in on its prey more accurately. Remarkable. 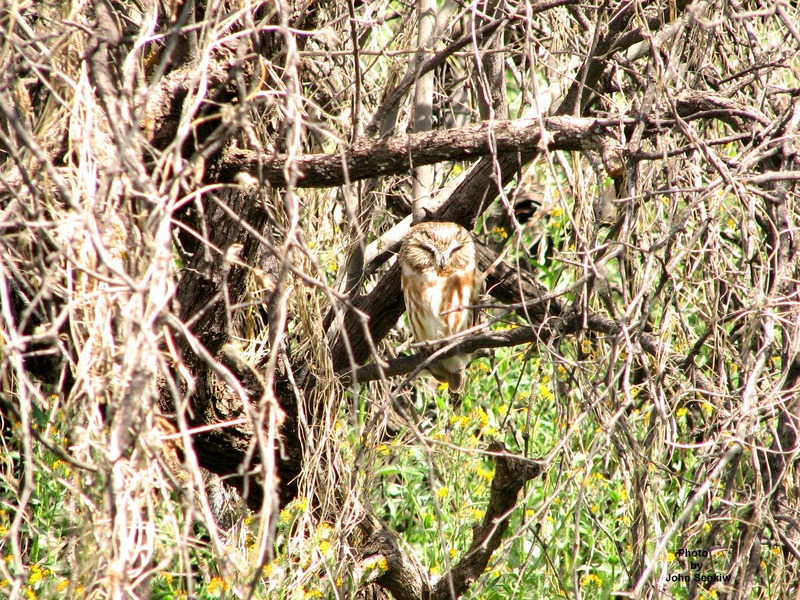 This week's photo of a spring male was taken at Llano Grande nature preserve in Weslaco, TX. It had just taken a bath so it looks quite shaggy.